Change is coming once again for National Hockey League goaltenders as this week’s GM meetings indicated that equipment will be scaled down after this season. The apparent focus on chest protectors and pants is long overdue as the two units have managed to escape much of the focus of past equipment changes. They’re also the only two units that haven’t been altered since the 2004-05 lockout, as pads, gloves and blockers underwent the most change. All of this is being done to hopefully inject more offense into the game. As goal scoring continues to dip, addressing oversized goal equipment is both an easy and obvious change to make. Oversized shoulder floaters will likely go the way of the Dodo along with other size-related changes. As a goaltender myself you might think I’d be staunchly against these changes, but I think they’re necessary at this time. Chest protectors and pants are still quite beefy and can stand to be tapered more to the shape of the player wearing them. I’m speaking specifically to the current construction of the shoulder floaters on chest pads today. This is a good example of the type of height you see from these units that not all companies fall in line with (here’s a unit with a more tapered look). There is certainly room for improvement here as new equipment materials allow for certain pieces of equipment to be slimmed down and more compact without sacrificing safety. Pants don’t need to be as wide in the leg as they are currently, chest protectors don’t necessarily require the width in the arms and shoulders so much as they need thickness in those areas. Adopting a strict, anatomically motivated guide to sizing chest protectors and pants should allow the league to cull the number of players wearing equipment that extends too far off their body or even equipment a size or two too big (yes this happens). 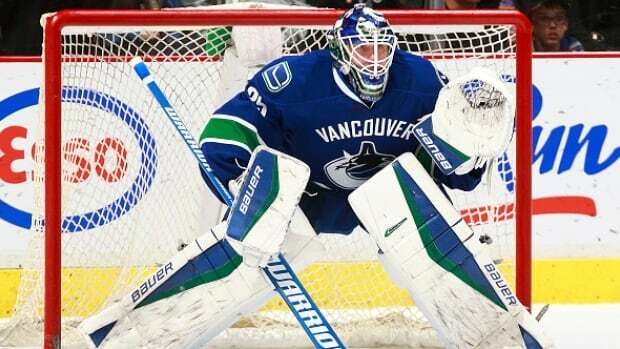 It will also help shave down areas above the shoulders and on the inside and outside of goalie’s legs. It’s hard to say how many goals this will add, but it’s certainly a good decision given that it can be done without putting goaltenders in harm’s way. Oddly enough, the last time a major rule change for goaltenders went into effect (2005-06), many goalies found the new, streamlined equipment to aid in their mobility. Losing an inch on their pads was a small price to pay in terms of weight savings and the ability to move side-to-side. While I don’t think making changes to the construction of chest protectors and pants will bring about the same type of claims, but it’s something to consider. In a world where goaltenders continue to improve their athleticism, streamlining the gear could truly benefit certain players. There is a larger issue here, of course, and that is the league is failing to realize the larger and likely more pressing issue at hand. It’s easy to say that they need to increase offense and simply cut down on goalie gear, but what about the other issues at hand? Obstruction is creeping back into the game, fewer penalties are being called and the league even added new rules that take goals off the board this very season. The post 2004-05 lockout world was one filled with powerplays, smaller goaltending equipment and plenty of goals. The league was enforcing rules that opened up play and rewarded skill players. As the referees have allowed previous infractions to slip, powerplays and goals have gone down. In the story I linked above, it references Sidney Crosby and Corey Perry’s goal scoring woes this season. They’re hardly the only two suffering these past couple of years and the story even notes that the league’s best players aren’t being given enough opportunity to score goals. Perhaps the league should look at the bigger picture here and realize they need to open things up. That goes well beyond the easiest decision of simply shrinking goaltender’s equipment or enlarging the nets. While I stand by the decision to address goaltending equipment, it’s obvious the league needs to address issues outside of the crease to truly improve scoring. It’s time to reestablish how the game was called beginning in 2005-06 so powerplay opportunities increase. Perhaps a closer look needs to be taken at shot blocking and how that is affecting the game (I personally don’t think there’s an effective way to police this action). Goaltending equipment certainly needs a slight tweak, but the league as a whole really needs to take a closer look at other key areas. Thankfully, the league is in a much better place than it was in 2005. Talent abounds and what the league needs to do is embrace this renaissance of skill. They took the first step with these equipment changes, they just need to take another one to truly remedy their issue.